One of the main challenges for this small deer in Alaska is the bad winters. They are native to the coastal rainforests of Southeast Alaska but were transplanted to the Prince Williams Sound and some islands like Kodiak and Afognak. 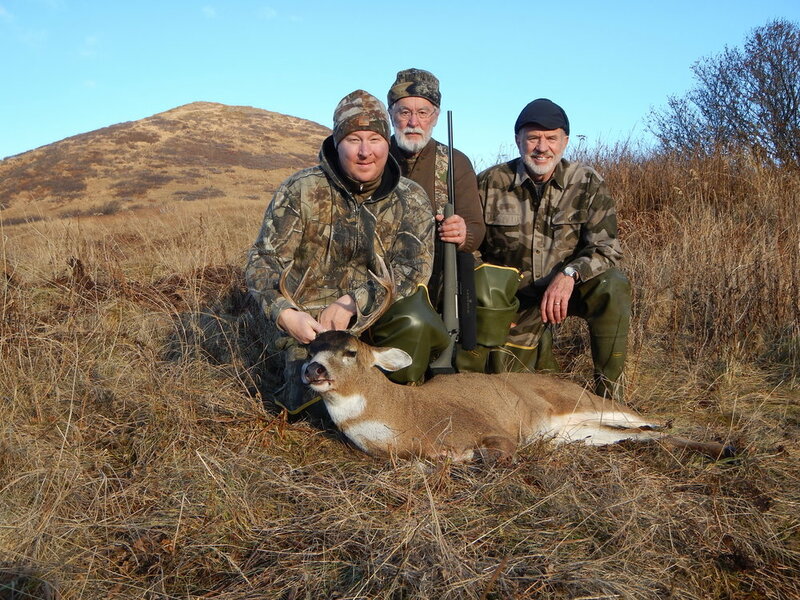 Deer populations in Alaska are dynamic and fluctuate considerably with the severity of the winter. They mainly can’t deal with the heavy snowfalls that Kodiak and some of the other islands sometimes get. If the snow comes early it pushes them down to the beaches where all the boat hunters can take their bag limit which at one time was five. After the hunting season closes most of them just starve. There have been years in some areas where the die off rate is as high as 95% and the bucks because of their poor condition after the rut are the first to die. This truly makes it difficult to get that four or five year old buck that may have a chance to make the Book. My best buck to date a beautiful 107 B&C. I have hunted in both high and low population years and the difference is amazing. 2014 was a good year for three and four year old bucks. That was the year that I hunted a new area and killed my largest deer, a beautiful 107 B&C gross scoring buck. He netted 102, missing the B&C book by six points. After another fairly mild winter in 2015 I took another good buck that was wide but had a short G-4 which grossed 107 B&C points but only netted 100. I was on a roll. Getting ready to leave after a great deer hunt. Sagen, me and my grandson Nathan. 2016 presented another mild winter so I made plans to hunt with my grandson Jared, my two old hunting buddies Earl and Dan and their sons Brian and Jake respectively. However, Jared was going to college and couldn’t get the time off so Dan’s future son-in-law Jonathan filled his spot. The population was high with lots of bucks in the mid 90’s. Jake and Jonathan both took nice bucks. I had Earl and Brian passing on everything if both of the G-2s weren’t split. After some miscommunication and a really big buck that didn’t give Brian a clear shot, he ended up with a nice buck scoring in the mid-80’s. It was his first buck so he was super happy. The only bad thing that happened was we placed his antlers in a tree so they would be safe from a fox or any other little critter that might try to drag them off. The wind came up that day and they fell out of the tree and you guessed it, a fox drug them off and we never found them after searching for them numerous times the next couple days. Brian would have to come back to get him a bigger buck. We all had a wonderful time and were looking forward to a do-over in 2017. (L to R) Brian, Earl and myself with Brian's first deer. 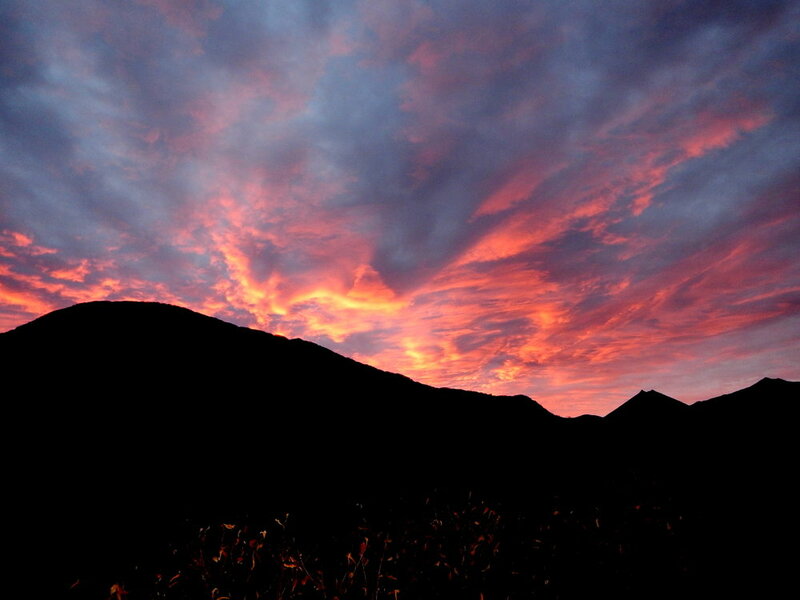 As always I watched the Kodiak weather daily. It seemed like another good winter with no major snows. I knew there should be many five year old bucks so I couldn’t wait and besides Sagen and Jared were going to go along with Earl, Dan, Brian and John. This was a big group, so we would spread it out like we did in 2016 with Dan and John going in four days early which would give us four or five days together. After the spring brown bear season I started hearing stories about people finding lots of winter killed deer. 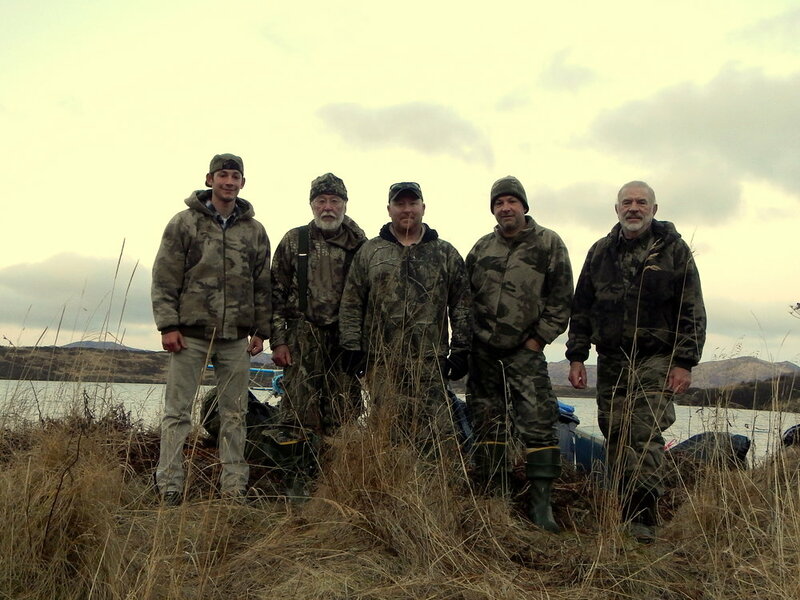 I called Rolan the owner of Sea Hawk Air to get his take and he agreed with me that it sure seemed like a normal winter for Kodiak but said he had heard from other hunting guides that said that the southwest side of the island had lost many deer. I brushed that off thinking I was right that it was too mild of a winter to kill many deer. A few days after Dan and John got dropped off Dan gave me a call on his Sat phone and told me that they hadn’t seen a single deer. That sounded really bad but it had been raining every day so I told him that was probably the reason. When we showed up at Sea Hawk Air I got more bad news about a tremendous die off especially on the side of the island where we would be. When we were loading the plane, Rolan told me that he had only flown in one mature buck, another blow. That night after we set up our tents and Dan and John got back to camp they told us that they hadn’t seen one buck and only a few does. After seeing so many deer last year that was hard for me to believe. Jared and a super nice camp set-up. Jared and Sagen on a great weather day. The next morning Dan and John headed back to where they were glassing from and the rest of us headed the opposite direction to my favorite glassing area. It didn’t seem as bad as Dan had said because we spotted a few bucks but they were all fork horns or two year old deer. Over the next few days with great weather we spotted about thirty small bucks with only one being full framed or a 2x3. We also spotted quite a few does with fawns. That was truly odd. How could “all” of the mature bucks and most of the single does have died? I just couldn’t figure it out. The last four or five days we hunted three areas that I had never hunted plus a couple that I always hunted but only more of the same. Sagen was hunting with his recurve bow and was looking for a good mature buck and Jared who had killed a super buck scoring 96 B&C points on his first deer hunt was hunting with his open sight .30-30 Winchester and was hoping to take a bigger deer. What a disappointment. I just couldn’t figure it out. The winter just wasn’t that bad! Rolan and the Sea Hawk Air Beaver. Dan and John left without seeing a buck. Earl and Brian were hunting my old spot and Sagen, Jared and I were hunting different spots each day hoping to see at least one mature buck. 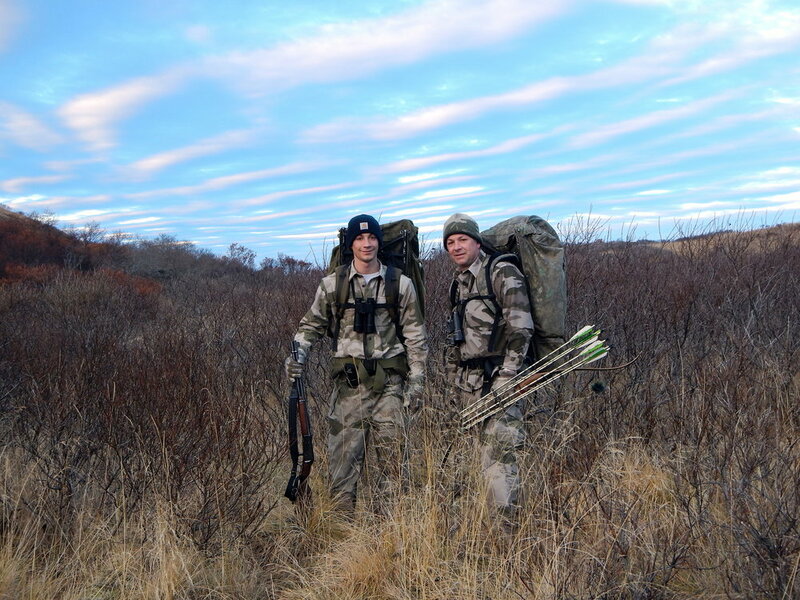 It was on the last day of our hunt when Earl and Brian who were hunting my favorite spot spotted a good buck. They made a great stalk and Brian killed a beautiful 105 B&C gross scoring buck. That was the only mature buck that the seven of us spotted in 12 days. It was truly crazy. 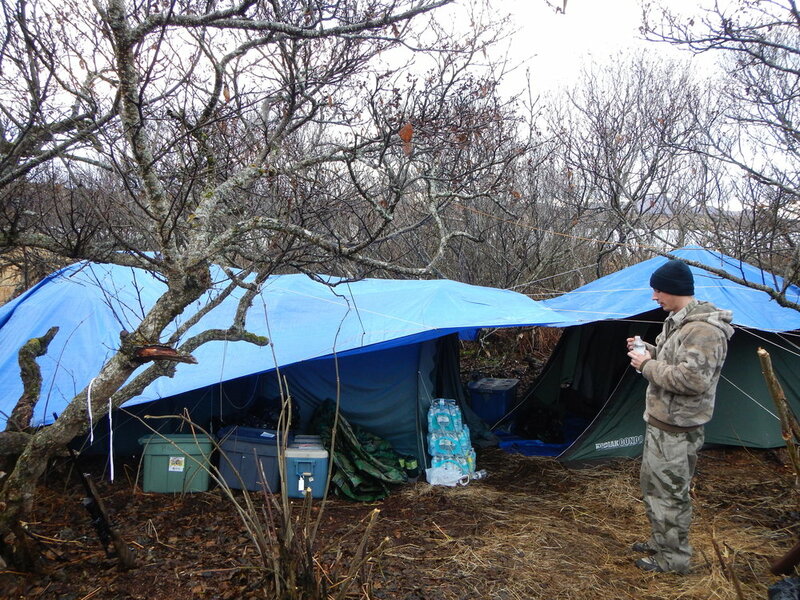 We had good weather, great fun and another Alaskan experience but only one deer. When Rolan picked us up he told me that the season had been a slim one for mature bucks in most areas of the island. He had heard that right after the rut Kodiak had a cold snap which froze all the fresh water ponds and streams so any deer in bad shape after the rut died. It was between 75-90% winter kill on most of the island. I still can’t figure out how all the pregnant does survived or at least many of them did in the area we were hunting. Brian with his 105 B&C gross scoring buck. A truly nice buck. Part of our 2017 gang. (L to R) Jared, Earl, Brian, Sagen and myself.